The PHENICX consortium is composed by 7 partners coordinated by the Music Technology Group at UPF, a top-level research lab in audio. Partners come from 3 different European countries (ES, NL and AT) with a mix of public / private cooperation. PHENICX partners involve four well-known research centres and universities: UPF, TUD, OFAI and JKU; as well as two important cultural content providers (RCO, ESMUC) and an SME from the creative industries (VD). This consortium covers the full value-chain: from research, innovation and product development to concert organisers (involving audience and semi-professionals as end-users). 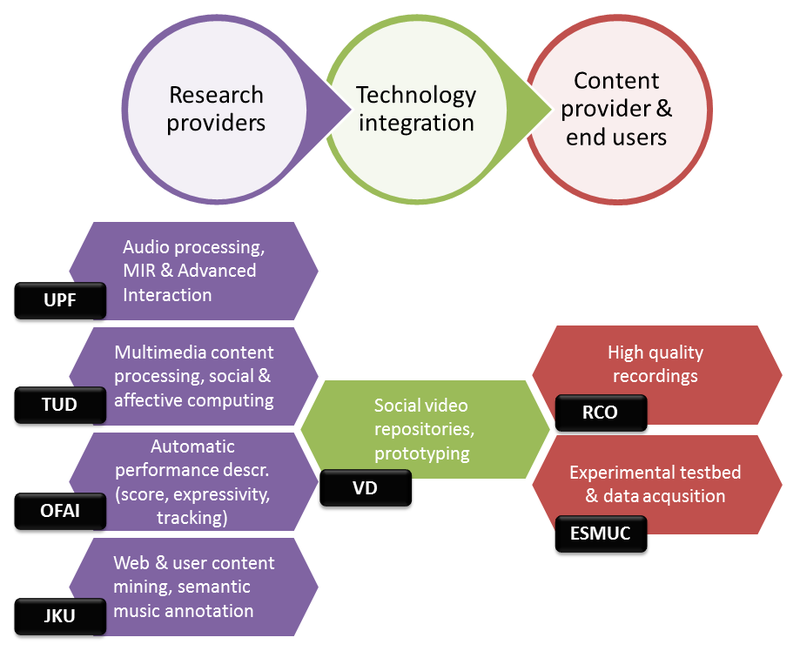 The research experience of the partners on the proposed areas (UPF, TUD, OFAI and JKU), the deep knowledge in concerts and music performances (RCO, ESMUC) and the market expertise with VD who has previous experience relevant for PHENICX envisioned technical solutions.